We pulled into Yosemite National Park at noon. I'd spent the last two weeks monitoring its every move. Wildfires and prescribed burn smoke completely filled the valley the week prior, but an inch of rain two days before our arrival not only helped manage those situations, but it also brought the valley's waterfalls back to life. Yes! We were stoked! I was still on probation with my kids from our backpacking trip in the Tetons, so we decided to make it easy and camp at a campground. We'd hoped to find a spot at Camp 4 in Yosemite Valley, but we were too late, and all campgrounds and lodges in the valley were full. We managed to find a spot at Hodgdon Meadow campground just inside the north entrance. We set up camp in record time and gathered wood. My niece found the LARGEST pine cone any of us had ever seen. (So cool!) We threw together lunch, and decided to head into Yosemite Valley to check it out before it got dark. 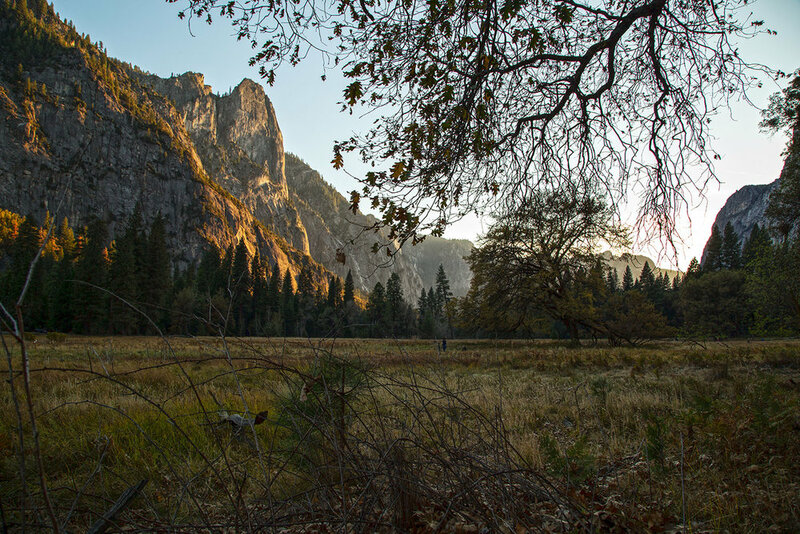 If you've never been to Yosemite (as we hadn't) driving into the valley is... an experience. Having spent the previous twelve days exploring five National Parks while driving through fourteen states, I thought we'd seen about every type of road. Of the many things ingrained in my brain from this trip, one is that many of our National Parks are wild and free places that at one time were not easily accessible, if accessible at all. And although there are now roads that allow us to enjoy them, those roads are often on sheer cliffs, dropping thousands of feet, with little (if any) guard rails, and very little wiggle room. God bless the folks that were tasked with building them. Half Dome was my only guide to Yosemite. I have a very dear friend that made the trek to the top, and conquering it changed her life. Just its mention makes her glow. About a half hour into our drive to the valley floor, we started to pop out on the edge of some pretty large mountains. Everyone started to sit up a little higher in their seats. But you still couldn't see Half Dome. A couple minutes later we went through a tunnel, and on the other side - an alternate universe. Yosemite Valley - Half Dome - in all its greatness, was in the distance. What seemed like a cliff minutes ago now looked like a hill. Everyone immediately reached for their door handles, and the car filled with "oh my gosh! ", "woah! ", "holy crap!" and "we're so high up!!" in-between a bunch of nervous laughter and a couple gasps. Sue, who was driving, immediately slowed the car to a crawl, trying her best to stop laughing long enough to bring the car under some order. Such a moment for all seven of us! After an hour drive from camp, we'd finally made it safely to the valley floor. (Whew!) Then it hit me. We had no plans for Yosemite. I had all but written it off due to the wildfires just a couple days prior. With serious, jaw-dropping beauty in every direction, we weren't quite sure what to do. So we did what came natural, stopping at the first trail we saw, running out of the car and down the trail! 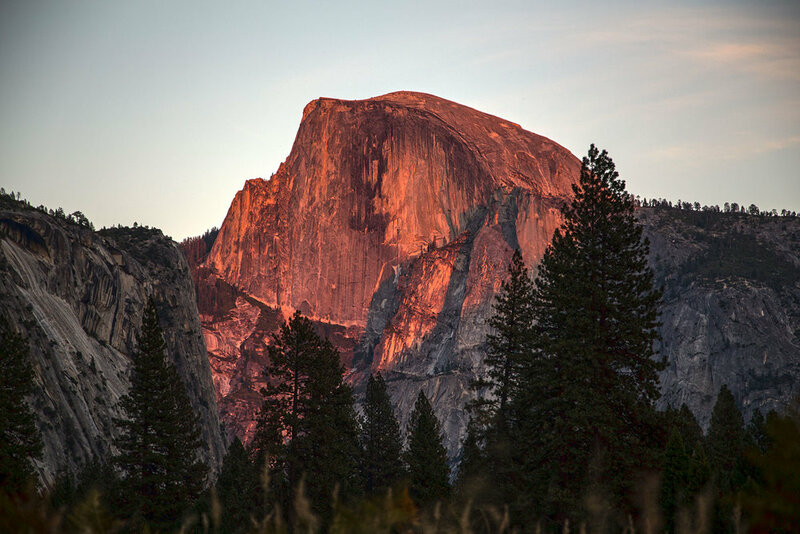 As the day started winding down, everyone was adamant that I watch the sunset on Half Dome. (I constantly remind my family how important it is to stop and watch a sunset and/or sunrise, and now they were returning that favor.) As I set out to do that, everyone else was ready to release some energy hiking a trail nearby. It was almost dark by the time we all met back at the car. Everyone was famished, and with an hour drive back to camp, we decided to grab a bite to eat at the galley-style restaurant just down the road. As we ate dinner, you could see it in all the kids' faces, nobody wanted to leave. After finishing up, Sue and I walked outside to pull the car around, and there it was... dark night skies over Yosemite, stars gleaming in every direction, outlines of the massive cliffs, cold crisp air. Oh man... I really didn't want to leave this valley. I tried to give myself a pep talk. "It's okay, you're figuring out what parks you need to come back to. Yosemite will be here waiting for you." Which quickly turned into, "Well, you could always drive an hour back to camp, make smores, get everyone tucked in, wait til they fall asleep, then drive an hour back to the valley, down a treacherous road, by yourself, in the dark." Yeah. It made perfect sense. But oh, what about sunrise? "Drive back to camp. Get everyone tucked in. Drive into the valley. Take in the stars. Drive back to camp. Sleep one hour. Get up. Make coffee. Drive back to the valley. In the dark. Again. Catch the sunrise. Drive back to camp." Wait... so how many times was I going to have to drive that road? By myself? In the dark? I realized how absurd my plan was, shrugging my shoulders. And at that moment I looked over and saw the reception area for Yosemite Lodge. What the heck, it can't hurt to try, right? Sue agreed, give it a shot. I walked in and waited while two receptionists were busy handling an upset family because their room wasn't on the same floor as their friends. Oh boy. They had their hands full. Finally, it was my turn. I politely explained (and pleaded) that Yosemite had taken us aback and asked if there was any chance I could get a room for the night. Without even looking at me, one woman said, "No. We're full." and left. Once she was out of sight, the other woman looked at me and said in a soft voice, "Well... wait. Let me check something. I'll be right back." She returned with a smile on her face and a room key. I lit up! And spent the next five minutes giving her many thanks for making it happen. We were staying in the valley! Star-gazing! Experimental night shots! Sunrise! All right there! We spent hours under the stars of Yosemite, finding constellations and taking pictures. We watched a climbers headlamp shine our way every few minutes as it inched up the enormous rock wall throughout the night. We managed to catch a beautiful sunrise, then went to pack up camp. We got back just as everyone was finishing up showers, packed up the car, and headed for our next adventure. The kids were in charge of picking the hike for the day, and they picked a good one! 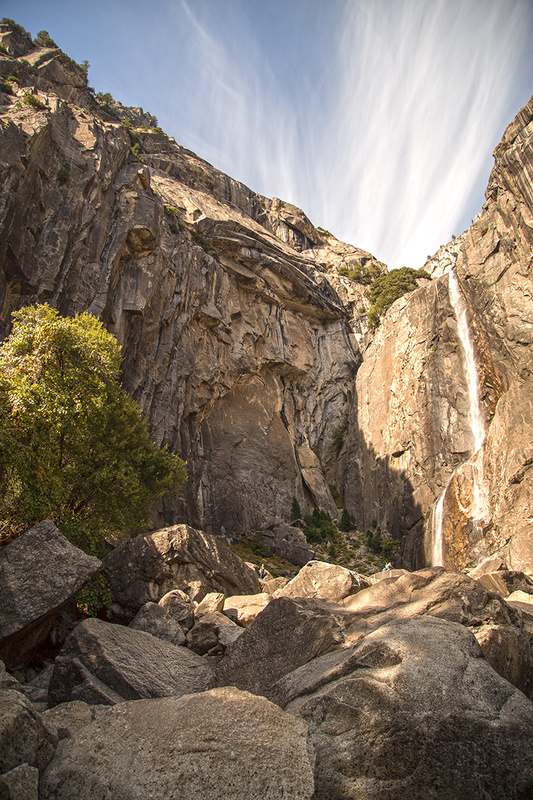 We rallied, hiking and rock-hopping our way to Lower Yosemite Falls, which is more or less a giant puzzle-like boulder field. You could see the kids actively planning their route, getting stumped here and there, having to find an alternate way. This whole place is just incredible and unique in the way that you're able to hike right up to these massive granite walls and touch em. I'm starting to understand why my friend glows every time she hears someone say "Yosemite". Such an incredible place. 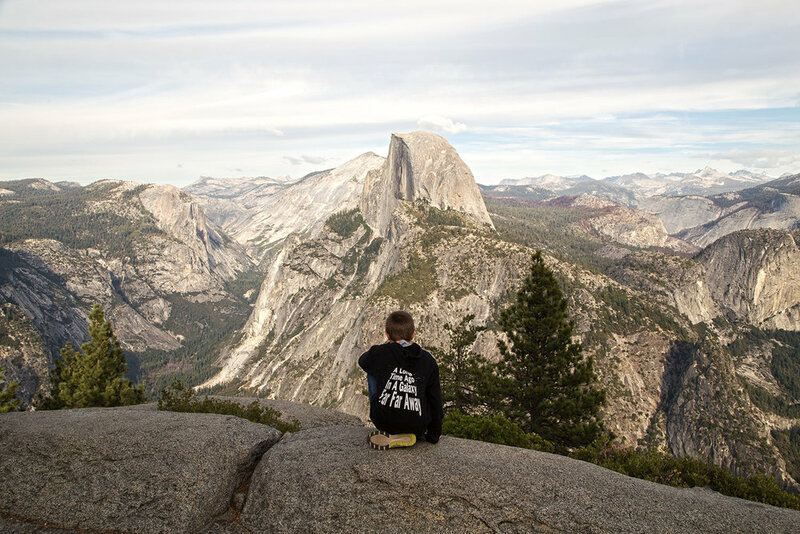 I'll be back for you - and Half Dome - when the cables are up. Thank you, Yosemite, for all you are.